Greening, G. J., Bess, S. N. and Muldoon, T. J. (2018). Immunohistochemistry Staining for Tumor-associated Macrophage Polarization in Murine Subcutaneous Colon Tumor Allografts. Bio-protocol Bio101: e3106. DOI: 10.21769/BioProtoc.3106. Tumor-associated macrophages are the most abundant immune cells in the tumor microenvironment and may express both anti-tumor and pro-tumor functions depending on their polarization towards an M1 (classical) or M2 (alternative) phenotype, respectively. This dual role has yet to be understood in many cancers, such as colon cancer, although it is known that pro-tumor functions include tumor growth, angiogenesis, immunosuppression, and matrix remodeling. Thus, tumor-associated macrophages have gained clinical momentum as cancer targets. To better understand the role of tumor-associated macrophages in the tumor microenvironment in response to various anti-cancer therapies, investigators typically implement an immunohistochemistry panel. However, immunohistochemistry protocols differ widely in their use of target surface markers, and many use intracellular antigens or only stain for single surface markers to quantify macrophage polarization, making reproducibility and study-to-study comparisons difficult. In response, we have developed a reliable and reproducible double immunostaining approach to quantify polarization of tumor-associated macrophages in murine tissue. Specifically, this immunohistochemistry staining protocol was developed for murine subcutaneous colon tumor allografts; however, this protocol can be readily modified to stain any murine tissue in allograft, xenograft, or orthotopic tumor models. This immunohistochemistry staining protocol is meant to be used and modified by investigators studying the causal effects between anti-cancer therapies and tumor-associated macrophages in murine tumors and to aid in reproducibility, consistency, and better study-to-study comparisons across the field. Tumor-associated macrophages (TAMs) are the most abundant immune cells in the tumor microenvironment (TME) in most cancers (Noy and Pollard, 2014), and also have the most substantial and pervasive effect of any immune cell in the TME (Chen et al., 2005; Allavena et al., 2008; Erreni et al., 2011; Marech et al., 2016). TAMs have been shown to have both anti-tumor and pro-tumor functions, depending on whether they are polarized more towards an M1 (classical) or M2 (alternative) phenotype (Chen et al., 2005), respectively, and their physical location within a tumor (Marech et al., 2016). In reality, M1 and M2 TAMs are the extremes of a continuum of intermediate cells which may have both anti-tumor and pro-tumor functions. Broad anti-tumor functions of classically activated M1-polarized TAMs include inflammation and immune response (Sugita et al., 2002; Funada et al., 2003; Zhou et al., 2010). On the other hand, pro-tumor functions of alternatively activated M2-polarized TAMs include tumor growth, angiogenesis, immunosuppression, and matrix remodeling (Liu and Cao, 2015). In most cancers, TAMs are skewed more towards the pro-tumor M2-phenotype (Yang and Zhang, 2017); therefore, TAMs have gained clinical momentum as immunotherapy targets for cancer. Currently, there are over 30 clinical trials targeting TAMs; strategies include reducing monocyte recruitment to the tumor and reprogramming M2-TAMs to M1-TAMs. Yang and Zhang provide a comprehensive review of TAM immunotherapy strategies (Yang and Zhang, 2017). Still many other groups are actively investigating TAMs in the basic science and pre-clinical realms (Cassetta et al., 2016; He et al., 2017; Jarosz-Biej et al., 2018; Suarez-Lopez et al., 2018). However, TAMs in some cancers, like colorectal cancer (CRC), simultaneously have both detrimental and beneficial effects on the patient (Zhong et al., 2018). The dual-role of TAMs in CRC has yet to be fully understood. It has recently been shown that macrophages induce resistance to fluorouracil-based chemotherapy, and that this TAM-induced resistance may contribute to the poor chemotherapy response in some CRC patients (Zhang et al., 2008; Zhang et al., 2016). Currently, a gap in colon cancer research is how therapy affects TAMs in the colorectal TME, and, in turn, how altering TAM population and polarization affects tumor therapeutic response. Therefore, this immunohistochemistry staining protocol was developed to stain for TAMs in murine subcutaneous colon tumor allografts, although this protocol can be used for other murine tissue. In this article, Balb/c mice were subcutaneously injected in the left flank with CT26 murine colon carcinoma cells. Tumors grew until they reached 75 mm3. 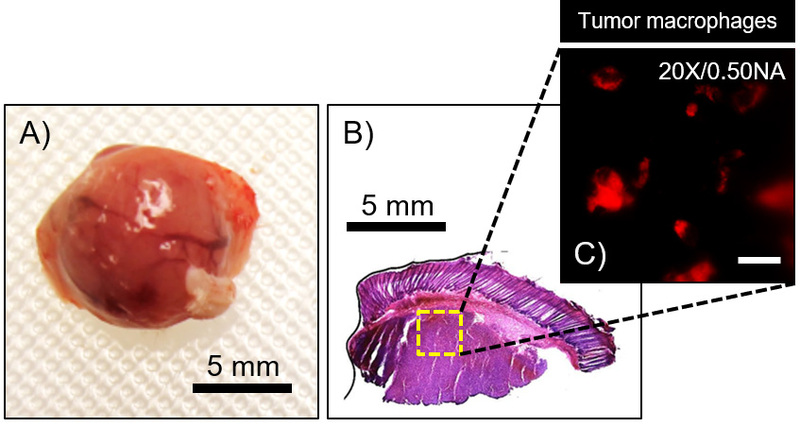 Following three days of additional tumor growth, untreated tumors were dissected, flash-frozen in isopentane and liquid nitrogen, and stored at -80 °C until cryosectioning, and then sectioned at a thickness of 5 μm. The scope of this article is on macrophage immunohistochemistry of murine tumors, not on the tumor model itself. Therefore, this protocol can be readily modified to stain any murine tissue in allograft, xenograft, or orthotopic tumor models. This direct immunohistochemistry staining method uses three primary-conjugated macrophage antibodies: anti-CD68, anti-CD80, and anti-CD206. CD68 is a pan-macrophage surface marker (Gordon et al., 2014), CD80 is a cell surface marker for M1-type macrophages (Zhou et al., 2017), and CD206 is a cell surface marker for M2-type macrophages (Kigerl et al., 2009). 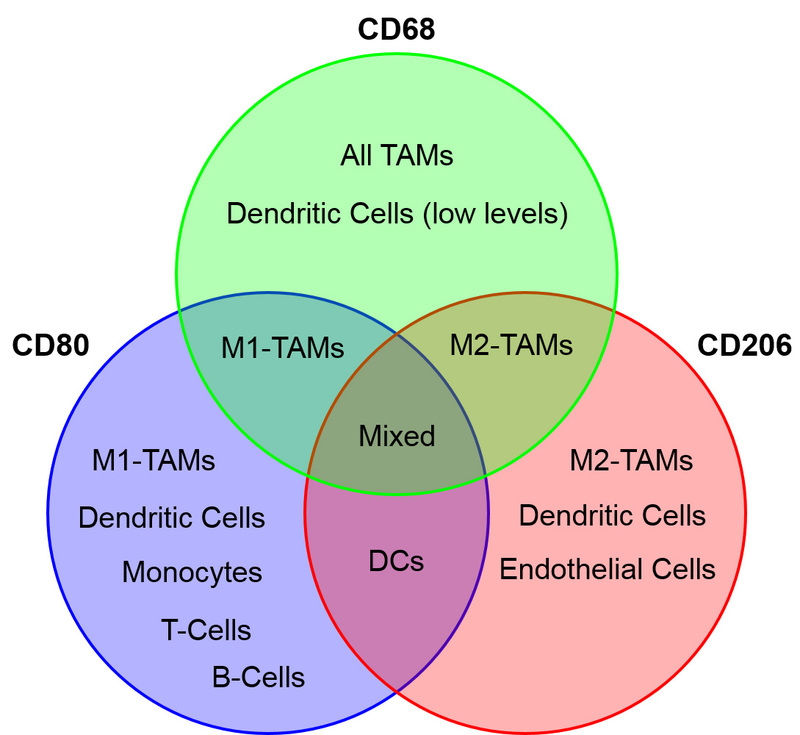 CD68, CD80, and CD206 are markers for other cell types as well but were chosen such that (CD68+/CD80+)-cells were considered M1-TAMs, (CD68+/CD206+)-cells were considered M2-TAMs, and (CD80+/CD206+)-cells were considered dendritic cells (DCs). Cells expressing all macrophage surface markers were considered to have a mixed M1-M2 phenotype (Figure 1). With this simple and reproducible method, we are able to accurately stain for M1 and M2 macrophages. To ensure long-term relevancy and usability of this protocol, this work also provides an easy-to-follow mathematical analysis of antibody concentrations so that readers can easily modify and optimize this protocol for their specific test system. This work is relevant for investigators developing and/or testing TAM-targeting cancer immunotherapies in mice. Figure 1. A double stain technique was used to distinguish M1- and M2- polarized macrophages. CD68+/CD80+ cells were considered M1 TAMs and CD68+/CD206+ cells were considered M2 TAMs. Additionally, CD68+/CD80+/CD206+ TAMs were considered to have a mixed phenotype. Note: This compound is toxic (GHS06), a health hazard (GHS08), and an environmental hazard (GHS09). It should be handled with protective clothing in a certified fume hood and disposed of at an approved waste disposal site per institutional regulations. The scope of this article is on macrophage immunohistochemistry of murine tumors, not on the tumor model itself; however, the tumor model is briefly described here. Five Balb/c mice (aged 10 weeks) were subcutaneously injected with 1 x 105 CT26 cells (passage 3) in sterile saline into the left flank until the tumors reached a volume of 75 mm3 (Greening et al., 2018a and 2018b). Three days after reaching this volume, the five untreated mice were euthanized, and the tumor was dissected for TAM analysis (Figure 2). This staining and imaging procedure works best with flash frozen tumors. Therefore, upon dissection, tumors were placed in a cryomold and covered completely in optimal cutting temperature (OCT). The cryomold with OCT and tumor was flash frozen in isopentane chilled in liquid nitrogen at -75 °C to -77 °C for at least 15 s and stored permanently in -80 °C until sectioning. The tumor was sectioned at 5 μm, although sections up to 10 μm are acceptable. Once sectioned, slides were stored for up to one month at -80 °C before staining. All antibody solutions and stained slides were handled in darkness. Figure 2. Dissection of tumor allograft for TAM analysis. Murine colon tumor allografts were (a) dissected and flash frozen. Tumors were (b) sectioned at 5 μm thickness (H&E shown for clarity, yellow box not to scale). Tumor sections were (c) stained for TAMs and imaged with a 20x objective at 10 regions of interest (ROI) along the section. Scale bar = 30 µm. Images enhanced for publication. Note: Keep at least 90 ml of acetone stored at -20 °C for at least 1 h prior to start of procedure. Remove 5 μm-thick slides from -80 °C. Place all slides in -20 °C. Keep the acetone for 20 min at -20 °C. Prepare macrophage antibody cocktail (see Recipes). Set out four EasyDipTM slide staining jars. Fill 3 staining jars with 90 ml of room temperature sterile PBS-T (see Recipes). Remove blocking solution aliquots (see Recipes) from 4 °C and set in 80-Place Storage System at room temperature. 20 min after Step A3, remove acetone from -20 °C. Fill final staining jar with 90 ml of -20 °C acetone. Place low-temperature thermometer in 1st staining jar with acetone. When the acetone reaches -3 °C, remove slides from -20 °C. Place slides (up to 12) in the EasyDipTM slide staining rack. Place the staining rack (with slides) in cold acetone for 10 min. Remove from acetone and air dry for 5 s.
Place the staining rack in PBS-T (2nd staining jar) for 2 min. Dip the staining rack in PBS-T for 1 min such that each “dip” is 3 s (20 total dips). Swirl staining rack inside slide staining jar for 1 min such that each “swirl” is 1 s (60 total swirls). Keep staining rack in PBS-T unmoving for an additional 1 min. Remove staining rack from PBS-T (2nd staining jar). Remove 3 slides from the staining rack. Keep the other slides (if there are more than 3) in the staining rack and place back in PBS-T. Using a paper towel, dry the area around the tissue sections without touching the tissue sections. Note: A hydrophobic barrier PAP pen may be used to keep reagents localized on the tissue specimen but is not required. Add 50-100 μl (depending on size of tissue section) blocking solution to each tissue section. Place slides (with blocking solution) in a dark humidified chamber at room temperature. Repeat Steps D1-D6 for additional slides. Incubate in the dark humidified chamber at room temperature for 60 min. Reapply 50-100 μl blocking solution to each tissue section. Note: The following steps must be performed in a dark room. Remove macrophage antibody cocktail from 4 °C and remove aluminum foil. Remove 1 slide from the dark humidified chamber. Add 100 μl of macrophage antibody cocktail to each tissue section. Place slide with macrophage antibody cocktail in a dark humidified chamber. Repeat Steps E2-E5 for additional slides. Incubate in the dark humidified chamber at room temperature for 2 h.
Remove the dark humidified chamber from 4 °C. Place all slides back in staining rack. Place the staining rack in PBS-T (3rd staining jar) for 2 min. Place the staining rack in PBS-T (4th staining jar) for 2 min. Remove staining rack from PBS-T (4th staining jar). Set all slides face-up on paper towel. Add 1-2 drops of Fluoromount-G® Slide Mounting Medium to each tissue section. Gently place 22 x 50 mm coverslip on each slide. Using tweezers, gently press out air bubbles. Wipe off any excess mounting medium. Let slides sit for 5 min. Apply quick-dry nail polish along the edges of the coverslip. Ensure edges are completely covered to prevent drying out of slides. Leave slides to dry for 1 h.
Store slides permanently in the dark at 4 °C. Remove slides from 4 °C, but keep in the dark. Place slide under a microscope. Turn on fluorescent lamp, microscope, and camera. Change the fast focus to 1,280 x 1,024 no binning. Change the quality capture to 1,280 x 1,024 no binning. Set the exposure to 100 ms.
Set the gain to 1x. Switch to the 20x objective. Use the DAPI filter and bring the CD80+ cells into focus. Note: In the 5 μm thick slide, some cells may be in-focus while others are out-of-focus. Starting 1 μm beneath the tissue surface, adjust the z-axis travel 1 μm between each step and take at least 4 images of the same location in the x-y plane (Figure 3). Without moving tissue location, switch to the FITC filter and bring the CD68+ cells into focus. 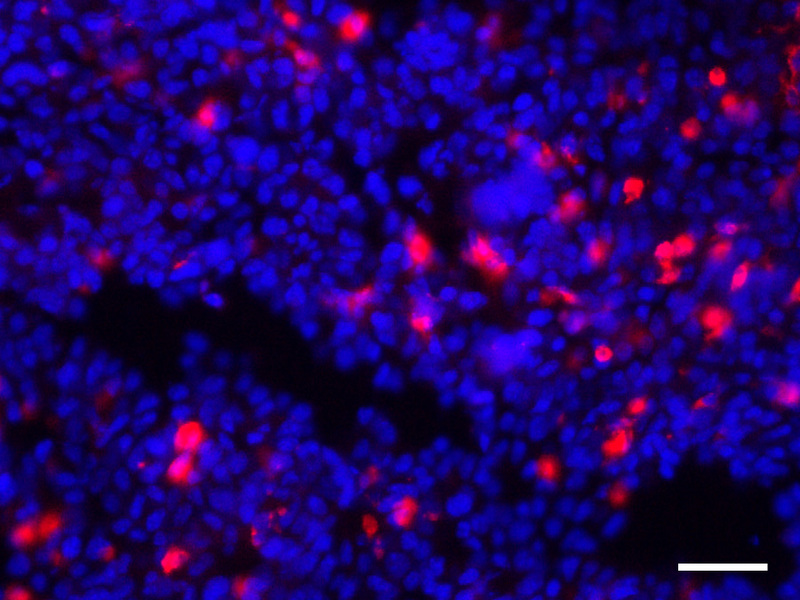 Note: See the note under step A11 (Image the CD80-stained cells). Without moving tissue location, use the Texas Red filter and bring the CD206+ cells into focus. Switch to a new tissue location and repeat Steps A10-A15. Acquire images from the desired amount of tissue locations. Note: In this study, 10 regions-of-interests (ROI) per tumor were imaged (image area = 31,100 μm2). Figure 3. Multiple images in varying z-axis depths of the same x-y location may be needed for accurate TAM counting. Notice the red-circled cell starts in-focus at (A) and is out-of-focus at (D). Alternatively, notice the yellow-circled cells start off out-of-focus at (A) and are in-focus at (D). Each image (A-D) represents a 1 μm step along the z axis. Scale bars = 40 µm. 20x/0.50NA objective used for each image. Images enhanced for publication. This part of the protocol may be modified depending on tissue section thickness and desired accuracy when quantifying image-based cell counts. Count CD68+ cells in each ROI. Count CD80+ cells in each ROI. Count CD206+ cells in each ROI. Determine the number of CD68+/CD80+ cells in each ROI. These are M1-polarized TAMs. Determine the number of CD68+/CD206+ cells in each ROI. These are M2-polarized TAMs. Determine the number of CD68+/CD80+/CD206+ cells in each ROI. These are TAMs with a mixed M1/M2 phenotype (Figure 4). Figure 4. Image of several TAMs imaged with DAPI (for CD80+), FITC (for CD68+), and Texas Red (for CD206+) filter sets. The composite image (ImageJ) shows a TAM with an M2 phenotype and a TAM with a mixed M1-M2 phenotype. Scale bars = 30 µm. 20x/0.50NA objective used for each image. If desired, determine the number of CD80+/CD206+ cells in each ROI. There are dendritic cells. Calculate the average number of M1 TAMs (included TAMs with mixed phenotype) per image area. Calculate the average number of M2 TAMs (including TAMs with mixed phenotype) per image area. Calculate average M1/M2 ratio per mouse (Figure 5). Figure 5. TAMs in subcutaneous murine colon tumor allografts. In untreated Balb/c-CT26 tumors, 3 days after the tumor reaches a volume of 75 mm3, there is a significant difference (P < 0.01) between the number of M1 (58.8 ± 18.7 cells/mm2) and M2 TAMs (127.5 ± 34.2 cells/mm2) in the tumor, resulting in an M1/M2 ratio of 46.1%. This protocol can be modified to include nuclear staining. Figure 6 shows a Balb/c-CT26 subcutaneous colon tumor allograft tissue section stained with DAPI and CD206 only. Figure 6. An untreated Balb/c-CT26 subcutaneous colon tumor allograft tissue section co-stained with DAPI and Alexa Fluor® 594 anti-mouse CD206. Scale bars = 100 μm. 20x/0.50NA objective used for each image. A limitation of this staining protocol is the absence of a reliable stain for DCs. In addition to being a commonly used pan-macrophage marker (Gordon et al., 2014), CD68 can also stain for DCs at low levels in some tissues such as the lung (Yu et al., 2016, Figure 1). To control for the possibility of DCs, this protocol may be modified to include a panel of DC-specific markers for murine non-lymphoid tissues on adjacent tissue sections (Yu et al., 2016). The following calculations aid in reproducibility of results and modification of the protocol for specific test systems. 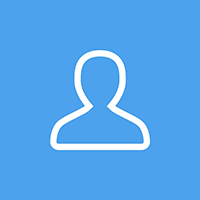 Stock antibody concentrations and amount of antibodies per vial are accurate up to the publication of this article and are subject to change based on manufacturer lot specifications. The desired dilution from stock were experimentally-determined in lab for the Balb/c-CT26 murine subcutaneous allograft model and may be different per specific test system. The volume of macrophage antibody cocktail represents the total volume of diluted antibody mix placed on the tissue section via micropipette before incubation at room temperature for 2 h. The average area of our tissue sections was ~50 mm2. Thus, we recommend a macrophage antibody cocktail volume per tissue section area of ~2 μl/mm2 (100 μl total per section). The proceeding calculations determine the volume of concentrated stock antibody to add to the macrophage antibody cocktail, and how many trials can be performed with these settings. Note: The following steps must be prepared in the dark. Note: This volume of 100 μl/section can be changed based on the size of the specific tissue section. More than one microcentrifuge tube may be used if staining multiple tissue sections requiring > 1 ml. Note: The following steps must be prepared in a certified biological safety cabinet. Note: If needed, solution can be placed in a 37 °C water bath for 5-10 min to aid dispersion. Note: If needed, solution can be placed in a 37 °C water bath to aid dispersion. This protocol is based on work supported by the National Institutes of Health (1R15CA202662-01), the National Science Foundation Graduate Research Fellowship Program (G.G., DGE-1450079), the Arkansas Biosciences Institute, and the University of Arkansas Doctoral Academy Fellowship. Any opinions, findings, and conclusions or recommendations expressed in this material are those of the authors and do not necessarily reflect the views of the acknowledged funding agencies. Competing interests: The authors declare that there are no conflicts of interests or competing interests related to this article. Ethics: The study was approved by the University of Arkansas Institutional Animal Care and Use Committee (IACUC #18060). Allavena, P., Sica, A., Solinas, G., Porta, C. and Mantovani, A. (2008). The inflammatory micro-environment in tumor progression: the role of tumor-associated macrophages. Crit Rev Oncol Hematol 66(1): 1-9. Cassetta, L., Noy, R., Swierczak, A., Sugano, G., Smith, H., Wiechmann, L. and Pollard, J. W. (2016). Isolation of mouse and human tumor-associated macrophages. Adv Exp Med Biol 899: 211-229. Chen, J. J., Lin, Y. C., Yao, P. L., Yuan, A., Chen, H. Y., Shun, C. T., Tsai, M. F., Chen, C. H. and Yang, P. C. (2005). Tumor-associated macrophages: the double-edged sword in cancer progression. J Clin Oncol 23(5): 953-964. Erreni, M., Mantovani, A. and Allavena, P. (2011). Tumor-associated Macrophages (TAM) and inflammation in colorectal cancer. Cancer Microenviron 4(2): 141-154. Funada, Y., Noguchi, T., Kikuchi, R., Takeno, S., Uchida, Y. and Gabbert, H. E. (2003). Prognostic significance of CD8+ T cell and macrophage peritumoral infiltration in colorectal cancer. Oncol Rep 10(2): 309-313. Gordon, S., Pluddemann, A. and Martinez Estrada, F. (2014). Macrophage heterogeneity in tissues: phenotypic diversity and functions. Immunol Rev 262(1): 36-55. Greening, G. J., Miller, K. P., Spainhour, C. R., Cato, M. D. and Muldoon, T. J. (2018a). Effects of isoflurane anesthesia on physiological parameters in murine subcutaneous tumor allografts measured via diffuse reflectance spectroscopy. Biomed Opt Express 9(6): 2871-2886. Greening, G., Mundo, A., Rajaram, N. and Muldoon, T. J. (2018b). Sampling depth of a diffuse reflectance spectroscopy probe for in-vivo physiological quantification of murine subcutaneous tumor allografts. J Biomed Opt 23(8): 1-14. He, H., Chiu, A. C., Kanada, M., Schaar, B. T., Krishnan, V., Contag, C. H. and Dorigo, O. (2017). Imaging of tumor-associated macrophages in a transgenic mouse model of orthotopic ovarian cancer. Mol Imaging Biol 19(5): 694-702. Jarosz-Biej, M., Kaminska, N., Matuszczak, S., Cichon, T., Pamula-Pilat, J., Czapla, J., Smolarczyk, R., Skwarzynska, D., Kulik, K. and Szala, S. (2018). M1-like macrophages change tumor blood vessels and microenvironment in murine melanoma. PLoS One 13(1): e0191012. Kigerl, K. A., Gensel, J. C., Ankeny, D. P., Alexander, J. K., Donnelly, D. J. and Popovich, P. G. (2009). Identification of two distinct macrophage subsets with divergent effects causing either neurotoxicity or regeneration in the injured mouse spinal cord. J Neurosci 29(43): 13435-13444. Liu, Y. and Cao, X. (2015). The origin and function of tumor-associated macrophages. Cell Mol Immunol 12(1): 1-4. Marech, I., Ammendola, M., Sacco, R., Sammarco, G., Zuccala, V., Zizzo, N., Leporini, C., Luposella, M., Patruno, R., Filippelli, G., Russo, E., Porcelli, M., Gadaleta, C. D., De Sarro, G. and Ranieri, G. (2016). Tumour-associated macrophages correlate with microvascular bed extension in colorectal cancer patients. J Cell Mol Med 20(7): 1373-1380. Noy, R. and Pollard, J. W. (2014). Tumor-associated macrophages: from mechanisms to therapy. Immunity 41(1): 49-61. Suarez-Lopez, L., Sriram, G., Kong, Y. W., Morandell, S., Merrick, K. A., Hernandez, Y., Haigis, K. M. and Yaffe, M. B. (2018). MK2 contributes to tumor progression by promoting M2 macrophage polarization and tumor angiogenesis. Proc Natl Acad Sci U S A 115(18): E4236-E4244. Sugita, J., Ohtani, H., Mizoi, T., Saito, K., Shiiba, K., Sasaki, I., Matsuno, S., Yagita, H., Miyazawa, M. and Nagura, H. (2002). Close association between Fas ligand (FasL; CD95L)-positive tumor-associated macrophages and apoptotic cancer cells along invasive margin of colorectal carcinoma: a proposal on tumor-host interactions. Jpn J Cancer Res 93(3): 320-328. Yang, L. and Zhang, Y. (2017). Tumor-associated macrophages, potential targets for cancer treatment. Biomark Res 5: 25. Yu, Y. R., O'Koren, E. G., Hotten, D. F., Kan, M. J., Kopin, D., Nelson, E. R., Que, L. and Gunn, M. D. (2016). A protocol for the comprehensive flow cytometric analysis of immune cells in normal and inflamed murine non-lymphoid tissues. PLoS One 11(3): e0150606. Zhang, N., Yin, Y., Xu, S. J. and Chen, W. S. (2008). 5-Fluorouracil: mechanisms of resistance and reversal strategies. Molecules 13(8): 1551-1569. Zhang, X., Chen, Y., Hao, L., Hou, A., Chen, X., Li, Y., Wang, R., Luo, P., Ruan, Z., Ou, J., Shi, C., Miao, H. and Liang, H. (2016). Macrophages induce resistance to 5-fluorouracil chemotherapy in colorectal cancer through the release of putrescine. Cancer Lett 381(2): 305-313. Zhong, X., Chen, B. and Yang, Z. (2018). The role of tumor-associated macrophages in colorectal carcinoma progression. Cell Physiol Biochem 45(1): 356-365. Zhou, Q., Peng, R. Q., Wu, X. J., Xia, Q., Hou, J. H., Ding, Y., Zhou, Q. M., Zhang, X., Pang, Z. Z., Wan, D. S., Zeng, Y. X. and Zhang, X. S. (2010). The density of macrophages in the invasive front is inversely correlated to liver metastasis in colon cancer. J Transl Med 8: 13. Zhou, Y., Yoshida, S., Kubo, Y., Yoshimura, T., Kobayashi, Y., Nakama, T., Yamaguchi, M., Ishikawa, K., Oshima, Y. and Ishibashi, T. (2017). Different distributions of M1 and M2 macrophages in a mouse model of laser-induced choroidal neovascularization. Mol Med Rep 15(6): 3949-3956. How to cite: Greening, G. J., Bess, S. N. and Muldoon, T. J. (2018). Immunohistochemistry Staining for Tumor-associated Macrophage Polarization in Murine Subcutaneous Colon Tumor Allografts. Bio-protocol Bio101: e3106. DOI: 10.21769/BioProtoc.3106.